LAS VEGAS—Boxing’s pound for pound king and the highest paid athlete in the world Floyd ‘Money’ Mayweather’s 18 year reign took another step towards the end after he polished off Marcos Maidana last Saturday Sept. 13 at the MGM Grand Garden Arena. His unanimous 12-round decision against Maidana bumped his undefeated record to 47-0 and his $32 million guaranteed payday continued to catapult him into another stratosphere. Mayweather gave himself a C-minus for his effort. His lip was swollen and he wore designer sunglasses to shield his eyes. However, while many of the 16,144 at the Grand Garden Arena may have been rooting for him to lose and disappointed in the way he approached his rematch, he will not be around too much longer. Mayweather has just two fights remaining on this historical $200 million contract with Showtime and while he may have agreed to the deal, he is short on controlling options. 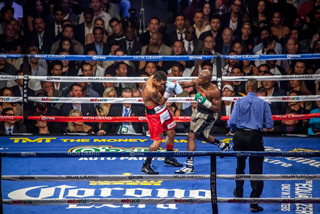 The fight was attended by sports heavies such as Hall of Famer Earvin ‘Magic’ Johnson, NBA superstar Kevin Durant. Academy Award winning actor Jamie Foxx, mega movie star Will Smith, former heavyweight champ Mike Tyson and a bunch of others. Tickets went from the low of $350 in the nosebleed section to $15,000 for floor seats, but the market for ‘Money’ is shrinking as quick as his days in the ring are evaporating. Several thousands seats were empty, veteran boxing writers are refusing to cover him; other prominent websites are dissecting his history of domestic violence against women. The mother of his children Josie Harris attended a domestic violence conference the day he was fighting and is publishing a book about her troubled relationship with him. Another former mistress Shantel ‘Miss’ Jackson has hired the attorney men love to hate Gloria Allred and is accusing him of an assortment of allegations. Floyd ‘Money’ Mayweather might escape the sport of boxing filthy rich and unscathed, but outside the ring the wagons of doomsayers are circling him. His former friend Curtis ‘Fifty Cent’ Jackson attacked his literacy, accusing him of not being able to read. Mayweather was apt in mentioning how many Teleprompters he reads during his promotions and strategically addressed that subject during his post fight press conference. “When I was younger I used to read about myself. I use to read a lot of the articles that was written about me, but I got to appoint to where I blocked everything out. Even today I will Google to read about certain things, but as I have gotten older and wiser, what’s more important is taking my promotional company, my family and different investments,” Mayweather said. He also dealt the volley of questions reading his final two opponents, namely whether or not he will finally fight Manny Pacquiao. Mayweather has the most savvy and shrewdest business people on his side in Leonard Ellerbe, his promoter and long-time friend, and advisor Al Haymon. He collects money from everything that is sold at the MGM Grand during one of his fights, from beer sales, to T-shirts and might also be receiving a cut of the gambling revenues from the hotel. If he so happens to spend all of the money that he’s made, Haymon has established a shelter that will pay him millions annually for the rest of his life, but it’s his legacy in the ring that is being questioned now. Baseball Hall of Famer Frank Robinson was among those in attendance at the post fight presser. Asked why he came and his answer was resolute. “I came to see Floyd Mayweather! He is without question one of the top five boxers in history all-time,” Robinson said. So, come May 2015 it will mark the beginning of the end, whether its two fights or as some suspect three fights, it will soon be over. Speculate all you might as to who he will or should fight, the next time you see him in the ring could be the last time.